VATICAN CITY (CNS) — The Holy Year of Mercy will be an opportunity to encourage Christians to meet people’s “real needs” with concrete assistance, to experience a “true pilgrimage” on foot, and to send “missionaries of mercy” throughout the world to forgive even the most serious of sins, said Archbishop Rino Fisichella. The yearlong extraordinary jubilee also will include several individual jubilee days, such as for the Roman Curia, catechists, teenagers and prisoners, said the president of the Pontifical Council for Promoting New Evangelization, the office organizing events for the Holy Year of Mercy. During a news conference at the Vatican May 5, Archbishop Fisichella unveiled the official prayer, logo, calendar of events and other details of the special Holy Year, which will be celebrated from Dec. 8, 2015, until Nov. 20, 2016. One way the pope wants to show “the church’s maternal solicitude” is to send out “missionaries of mercy” — that is, specially selected priests who have been granted “the authority to pardon even those sins reserved to the Holy See,” the pope wrote in “Misericordiae Vultus,” (“The Face of Mercy”), the document officially proclaiming the Holy Year. The priests will also have to “be patient” and have “an understanding of human fragility,” the archbishop said. Bishops can recommend to the council priests from their own dioceses to serve as missionaries of mercy, he said, and priests themselves can submit their request to serve, he said. When a priest volunteers, however, the council will confer with his bishop to make sure he would be “suitable for this ministry” and has the bishop’s approval to serve temporarily as a missionary of mercy, he said. The archbishop emphasized the importance of living the Holy Year as “a true pilgrimage” with the proper elements of prayer and sacrifice. “We will ask pilgrims to make a journey on foot, preparing themselves to pass through the Holy Door in a spirit of faith and devotion,” he said. More than a dozen individual jubilee celebrations will be scheduled in 2016, such as a jubilee for consecrated men and women Feb. 2 to close the Year of Consecrated Life; a jubilee for the Roman Curia Feb. 22; a jubilee for those devoted to the spirituality of Divine Mercy on Divine Mercy Sunday April 3; and separate jubilees for teenagers; for deacons; priests; the sick and disabled; and catechists. A jubilee for “workers and volunteers of mercy” will be celebrated on Blessed Mother Teresa of Kolkata’s feast day Sept. 5 and a jubilee for prisoners will be celebrated Nov. 6. Archbishop Fisichella said the pope wants the jubilee for inmates to be celebrated not only in prisons, but also with him in St. Peter’s Basilica. He said the council is discussing the possibility with government authorities and is not yet sure if it can be done. The Vatican is asking bishops and priests around the world to conduct “similar symbolic gestures of communion with Pope Francis” and his vision of reaching out to those on the margins. 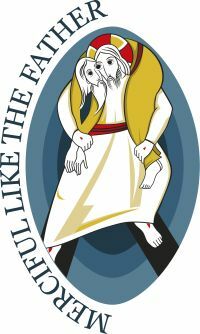 At the news conference, the council distributed copies in several languages of the Holy Year prayer and logo, which features Jesus — the Good Shepherd — taking “upon his shoulders the lost soul, demonstrating that it is the love of Christ that brings to completion the mystery of his incarnation culminating in redemption,” the archbishop said. The council has joined with the United Bible Societies to distribute to pilgrims 1 million free copies of the Gospel of Mark; the texts will be available in seven languages. The official prayer in English here. The prayer in Spanish here.